Semi Metallic Brake Pads Noise On A New Car - What That Might Be? Semi Metallic Brake Pads Noise On A New Car – What That Might Be? As brakes are easily the most important safety component on your car any noise from this area can trigger worry on the driver’s part. The key to determining what the problem is with the type of sound the brake pads make. Sounds can come from a variety of sources. Sometimes it can be dust or dirt that gets into the rotor or front brake pads that can cause noises. Other times it can be due to the components wearing down. When you apply pressure to your brakes you may heal a squeaking sound. If this is the case and you have a newer vehicle this isn’t a cause for alarm. Many new models come equipped with semi metallic brake pads, which are harder. This in turn means when the pads squeeze together it will produce a vibration and you will hear a squeaky sound as a result. This in itself isn’t a cause for alarm and you can rectify the problem by applying milk spray or lotion on the back of the semi-metallic brake pads. By doing this it will eliminate any noise. If you don’t want to deal with the problem you can also replace your semi metallic brake pads with something else. 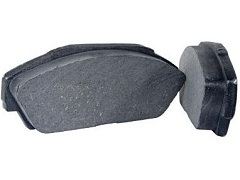 When comparing ceramic brake pads vs semi-metallic, you’ll want to weigh the benefits of each. Ceramic are known for producing less dust, which helps prevent materials from getting inside the wheel and brake components. This can lead to greater durability over the long haul. While they are more expensive than semi metallic brake pads drivers enjoy the quiet ride and long term durability they offer. Regardless of which type of pads you choose, it’s important to be able to make a proper diagnosis when your pads make noise. This may mean inspecting the parts. With brake pads, you’ll want to measure them to ensure they are at least an eighth of an inch thick, if not, it’s time to change brake pads. When you replace them, you’ll want to find a quality brand name like Wagner brake pads that can offer you excellent performance and handling over the long haul. Ultimately, there are many reasons why pads can make noise. By accurately analyzing the sound and inspecting the parts you are able to determine what the problem is. It can also help you decide whether a replacement or additional service is needed.